Tagged under Kaori Yuki, Hal Film Maker, Series. Setsuna has a bit of a problem that most teenagers do not have: He is in love with his sister. However, things only get worse when he and his sister begin to be attacked by things calling themselves Angels, who claim to be after him because apparently he is a reincarnation of one of the most powerful angels ever. Together, he and his sister get pulled into a war between heaven and hell. Because the anime is only and OVA with three episodee while the manga has 20 volumes it is hard to fit the whole story in the anime. So the OVA only covers the first arc of the manga which goes until the middle of the fourth volume. And also this part was strongly cut to tell the story in only 90 minutes. Itâ€™s a pity that this manga wasnâ€™t made into an anime because itâ€™s my most favourite manga but considering the story it becomes rather clear why it wasnâ€™t made into a whole anime series. Also two characters are completely missing from the anime who played a major role in the first story arc. It is also important that you should read the manga first befor you watch the anime because then you will understand the story better. Angel Sanctuary is a great read for anyone who enjoys a darker story. The artwork is absolutely beautiful with details spreading from panel to panel. One thing that really makes this series stand out is the dark and detailed plot Kaori created. It's not every day I find a series that's this well written with all of the perfect elements needed to create an involved struggle between heaven and hell. A great story. Kaori Yuki is one of the best manga creators, not only her drawings are great, her stories too. This particular one is so cool. I'm really fascinated by her imagination. I'm speechless. I definitely recommend it. Moreover, it changed my opinion about religion, I do not believe in God, but people only know one part of the story, the manga talks about a god who didn't love his own children, the other side of god,a bad side and it's good to know that someone is fair and not afraid to show the world what she think. She is a role model. I admire her. i haven't seen the anime, but i love the manga ^.^ This is the first Kaori Yuki manga i've read and its awesome! the story line is very dense and complex and unexpected. I love the characters especially Michael, i love his tattoo!!! disturbing yet strangely addicting. I don't know why or how I was able to sit through this, buy this and add it to my list of favorites that I liked. I know the plot was needed but seriously did they have to go that far into things? but at any rate it wasn't all that bad, just wished that they sort of toned down some on the disturbing parts. 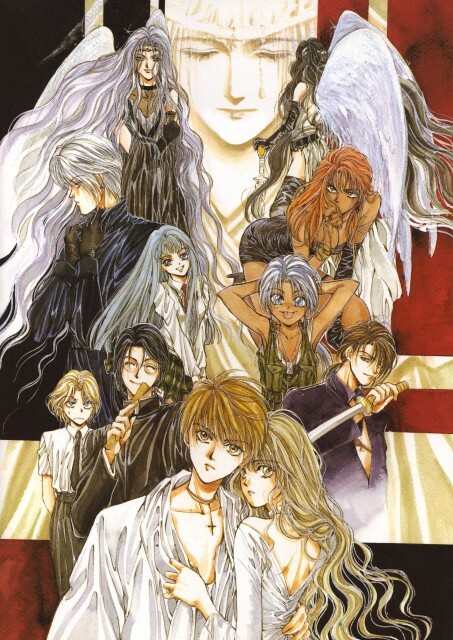 This OVA was meant to be an introduction to the best manga I've ever read: Angel Sanctuary. It did catch my attention and got me to read the manga, so for it's purpose, it was great. Stand alone though, it is not a good adaptation. Read the original. ???????? ??????? ??? ????? ? ??????. ????? ?, ????? ?, ???? ?, ?????? ????? ????. ???????????? ??? ? ?????? ??. ? ???-?? ?????????? 3 ???? ?, ??????????????. ?? ? ???? ?????? ?? ???? ?, ??? ????? ???????? ??? ?????????. ? ??? ?????? ?????? ???????? ???????. The anime was good but I'm rating the manga here. I say that had the anime covered the rest of the manga it would be one of the best out there! The stiry is amazing and the art is very beautiful. It is the best manga I've ever read. I highly recomend it!